Baking, Sewing & Social Tinkering — Wonderful Idea Co. 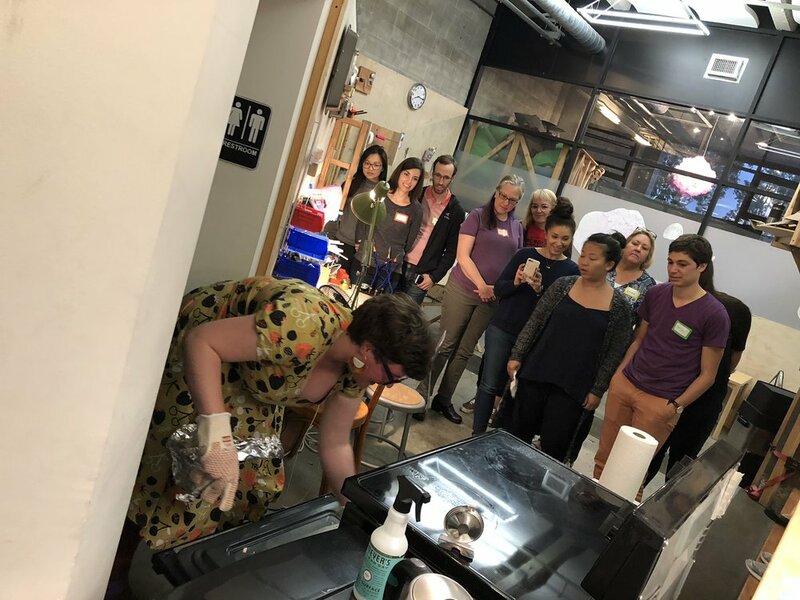 This summer we launched a series of social tinkering workshops for adults in our pop-up space at the Brightworks annex. We collaborated with several local artists and makers to explore new ideas around making with different tools and materials. Our first workshop was creating piezo microphones and then sampling found sounds with Sarah Dot and Memeshift. For the second event we moved to a less traditional subject for tinkering with Sadie Scheffer from BreadSRSLY sharing tips about gluten free baking and sourdough secrets. 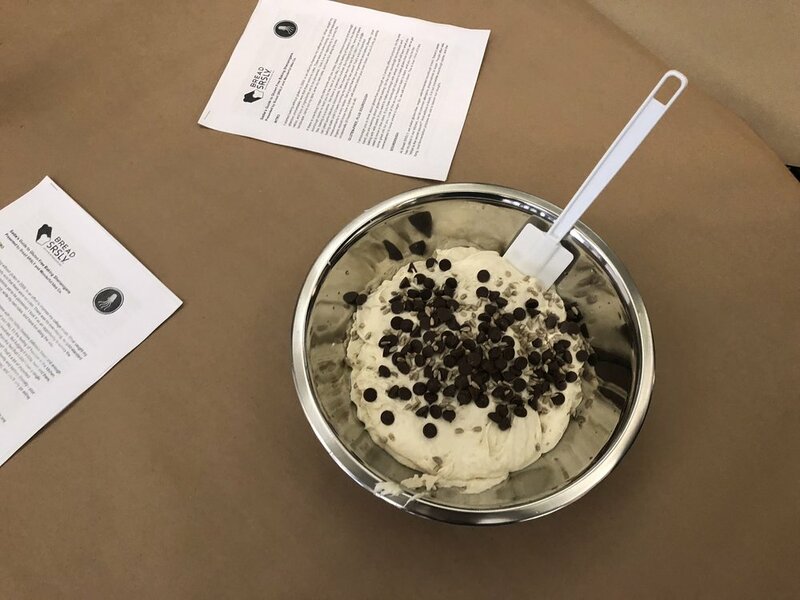 For timing purposes we started the workshop by stirring mix-ins like dried berries, chocolate chips, fennel seeds and chocolate into some premade dough. Each of the groups collaborated to make a unique creation with sweet and savory elements. Next each team poured their mix into a ziploc bag, snipped the corners and poured the dough into muffin tins. Teams all demonstrated bit of creativity as they constructed aluminum foil shields for their pans to keep the moisture contained. We put the sourdough muffins in the oven and Sadie spent some time explaining her process of gluten free baking and taking care of the sourdough starter. It was so cool to see the way that her process really echoed the tinkering spirit as she mentioned words of wisdom like expect the unexpected, keep track of your experiments and don't worry about following the rules. After about an hour of conversation it was time to take the bread out of the oven. Everyone was impressed with the quality of the golden brown crust and the delicious taste especially combined with a excellent collection of spreads donated by local companies. Everyone had a really fun time tinkering with new culinary tools and materials and thinking about the creative process in a different way. The next week we partnered with our friends at Amped Atelier for an evening event centered around the theme of sewable circuits and wearable technology. Hal and Sahrye led a workshop for people to make light up cat ears with blinking RGB LEDS connected to lilypad components. It was great to get a friendly and approachable introduction to the complex topics of sewing and electronics through a printed guide, helpful tips and the time and freedom to explore the materials. People worked about about two hours to put together the fashionable accessories and were really proud of their creations at the end of the event. It was fun to see participants taking selfies and posing for group photos wearing their ears. It was also educational for us to learn from e-textiles faciliation experts and see how they introduced sewn circuits. We've been trying this activity a bit with kids at our camps and workshops and can learn a lot about the best way to introduce the idea. We're looking forward to checking out the upcoming book, "Make It Wear It" by Hal and Sahrye. Overall it was a really fun experiment to try all three of these social tinkering workshops. We'll plan to continue these events during the year as we look to new frontiers for materials and topics for tinkering.